ACN supports St John the Merciful Table which is a relief kitchen run by the Melkite Greek Catholic Church in Zahlé, close to the Syrian border. 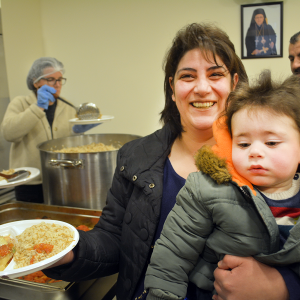 It offers food and friendship to Syrian refugees who have fled to Lebanon and who are now struggling to fend for themselves. Every day, the relief kitchen provides hot meals for around 600 people including the elderly and families with young children. Your gift could help provide the next hot meal for a displaced family in dire need in any of our relief kitchens in the Middle East.